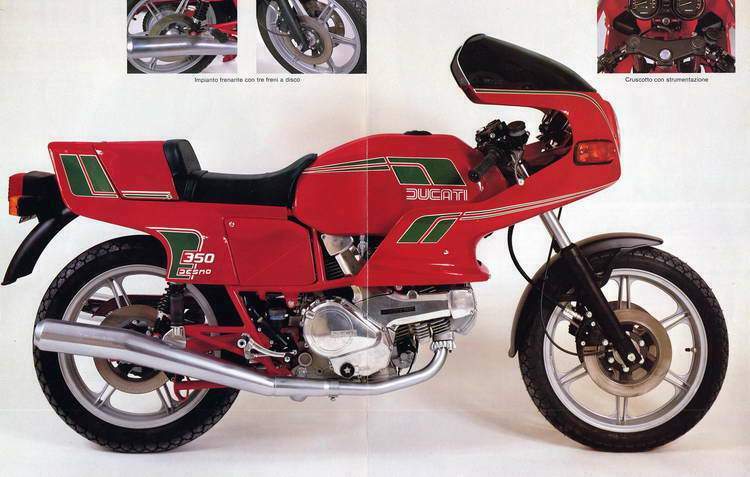 The Pantah XL was a simplified version of the fully faired Pantah SL 350, aimed mainly at the Italian market. It was sold in Spain and Greece as well but I am not aware it ever reached the bigger English-speaking markets. The Italian law offered several advantages to 350 cc bikes: lower VAT purchase tax, lower insurance and road tax, and they could be ridden at 18 years of age, while one had to be 21 to ride a bigger capacity bike. 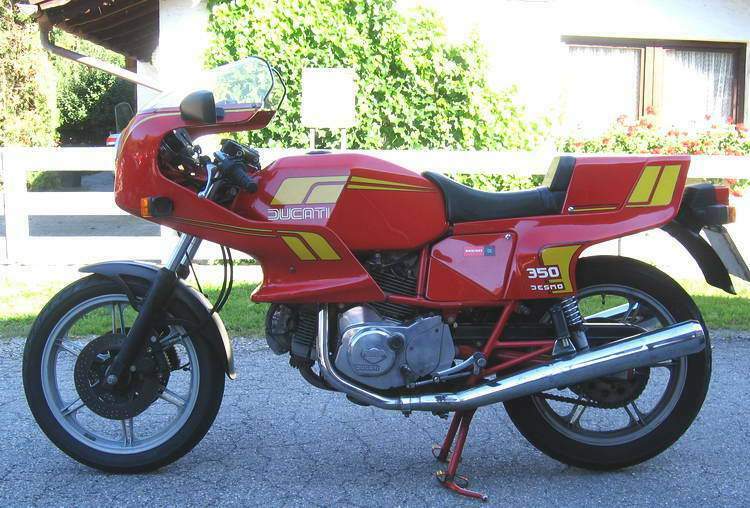 So, most Italian bikes that were born 500 cc were also made in 350 cc versions: the Laverda 8 valve twin, the Guzzi “small block” series and the Ducati parallel twin among them. With the XL Ducati went a little further than just fitting an underbored engine to a big bike: the fixed fairing was removed and a small nose fairing identical to that of the TL model was fitted, some accessories were removed or replaced with cheaper ones to lower the price: there wasn’t the pillion seat cover, the brake discs were solid, the rear shocks were the cheaper Paioli without external reservoir, slightly raised handlebars took the place of the clip-ons… All in all a good bike with a powerful little engine that loved to rev high: max power was claimed to be 38 hp @ 11500 RPM! The TL was the first attempt to make a touring bike from the Pantah. Although the Pantah was launched as a “sport touring” bike to be ridden two up, it certainly wasn’t and the need for a more sedate and comfortable bike was felt. So a more comfortable riding position and milder cams were designed for the “Touring L model”. Unfortunately, also a new bodywork was designed. The most positive definition that comes to my mind for this bike’s cosmetics is “perplexing”. The seat and tank are ordinary looking at best, the little nose fairing is something already seen on some Japanese bike of the time. But the long sidepanels that hide the top cylinder are a designer’s bad dream. They hide the vertical cylinder so that motor looks like a horizontal single, Aermacchi style, and the whole bodywork looks heavy and tall. The whole bike reminds of a large semi-bodied scooter. Removing the sidepanels, or hiding them under a proper fairing made things a little better. It’s a real pity that the TL was so ugly, because it was a good bike. Despite being tuned down from the SL 600, it was fast enough to compete in its class (which included the Guzzi V65, the BMW R60 and the Yamaha XZ 550) and had all the stability and handling virtues of the SL600. The TL was built in 350 and 600 cc versions and was the starting base for the Alazzurra with which it shares more than one can imagine. For example the whole footpegs and pedal compartment is identical.